Located at the foot of the Latemar Massif of the Italian Dolomites is Lake Carezza, which is one of the most beautiful areas within the Trentino-Alto Adige region of northern Italy. 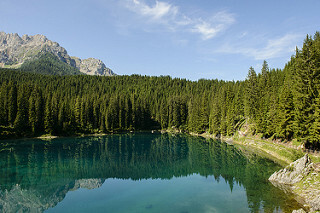 The lake is supplied by water from underground springs and melting snow from the Dolomites. Surrounded by stunning landscape that includes towering firs and spruce trees as well as snowcapped mountains make this an ideal location for a romantic getaway. The crystal clear waters of the lake reflect the beauty of the area, which creates a rainbow of colors on the surface. If you were to ask the Ladin people they would have a fascinating story as to why the lake sparkles like the color of the rainbow and why they call it Lec de Ergobardo (the Rainbow Lake). 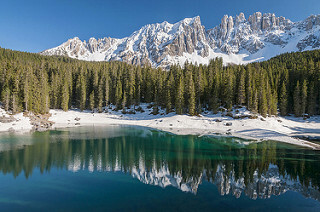 According to the legend a beautiful water nymph made Lake Carezza her home. She would sit along the shore braiding her hair and amuse herself by singing. She was accustomed to being alone so she never imagined anyone would hear her beautiful singing voice. One day the sorcerer of Masarè was travelling near the lake when he heard the nymph singing. He immediately fell in love with her, but he did not know how to seduce the lovely nymph. The nymph was very shy and whenever someone approached her she would disappear in the lake. The sorcerer tried with all his magic to capture her, but he was unable to. Distraught he sought the advice of Lanwerda the witch. Lanwerda told the sorcerer to dress up as a jewel merchant and cast a rainbow that stretched from Catinaccio to the Latemar mountains. The nymph will be curious of the rainbow and wonder what it is. The sorcerer carried out his plan and created a beautiful rainbow that immediately caught the eye of the beautiful nymph. The sorcerer in his excitement to capture the nymph forgot to put on his disguise. The nymph realized it was a trap and she disappeared never to be seen again. The sorcerer in a fit of rage smashed the rainbow and all the pieces fell into the lake and the colors of the rainbow spread all over the surface. The beautiful colors of the lake continue to resonate through the water to this day.